Pulled pork seems to be all the rage in the local cafes of late. I absolutely love it as well, so I’m not surprised. For those who have happened not to have come across this, it is delicious, fall apart in your mouth pork shoulder which has been slow cooked over a number of hours until the connective tissues of the meat soften to melt-in-your-mouth deliciousness, then literally pulled apart with a fork or by hand. It is often used in South East American cuisine. Pulled Pork has a reputation for a reason. A nommy reason. From my research I discovered that there are a number of variations of traditional pulled pork. South Carolina cuisine uses a mustard based sauce, while the traditional Tennessee version uses a vinegar or tomato based barbeque sauce. Regardless of the sauce that goes with it, pulled pork should be juicy and tender. I’ve gone with a Chipotle BBQ Sauce which you can find below the pulled pork recipe. 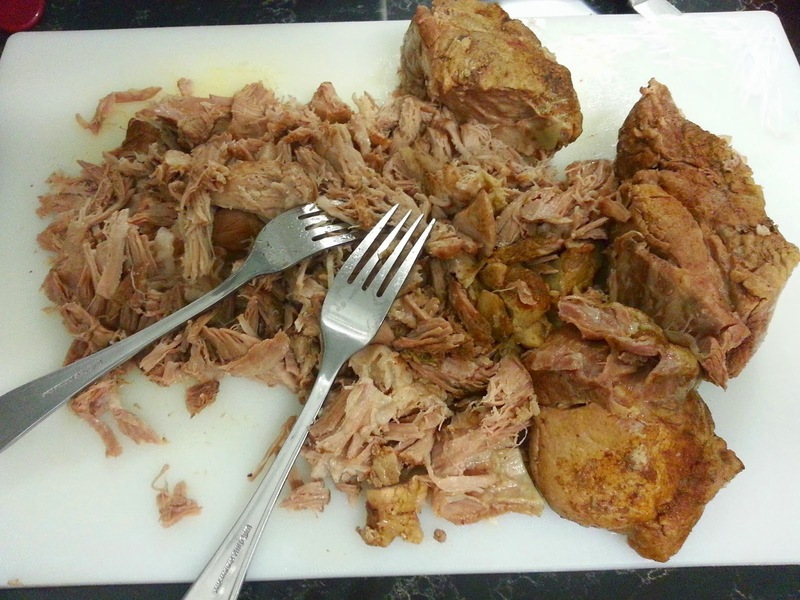 Pork shoulder is the traditional cut of meat used for pulled pork, so I have sourced a lovely cut from my local butcher. I asked my butcher for enough to make pulled pork for a pizza and four burgers or wraps. He gave me a 2.5kg shoulder which made much more than I had expected. With this I made two pizzas, five wraps and I still have more left over which I have in the freezer to stir through a pasta recipe at a later date. So please adjust the below recipe for the amount that you would like to make, just following the approximate ratios. Watch this space for recipes for all of these over the next little while. Please adjust quantities based on how much you want to make. You could change this up by switching the spices in the rub. You could also leave this and the searing off if you want an easier version. What you can’t spin is that pulled pork SHOULD take hours in the slow cooker for a long time in order for it to become melt in your mouth tender. I have chosen to stir sauce through mine but you could elect to skip this in order to use the pork in different meals requiring different flavours. 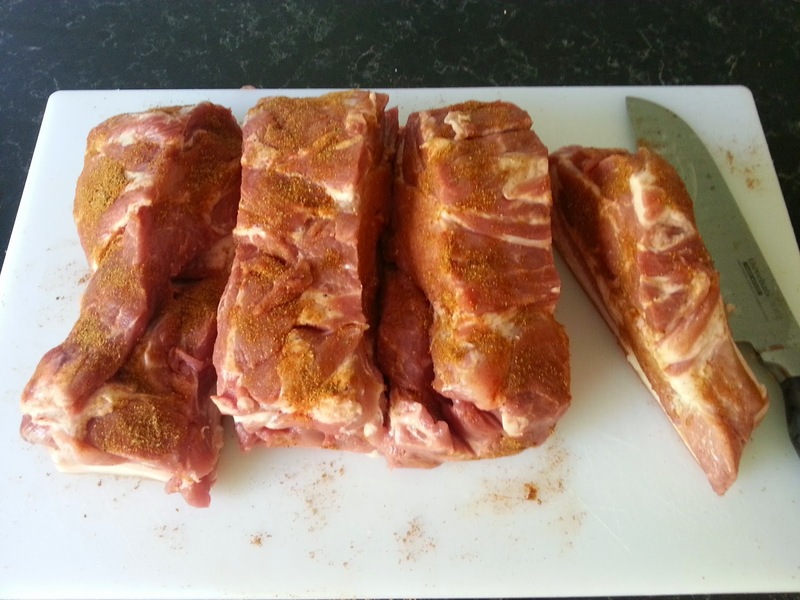 Chop the pork shoulder into segments. Rub with spice salt and pepper mix. Sear pork in a frypan with a small amount of rice bran oil on high heat for 10 seconds per side. Then lay each slice of the pork shoulder on top of the garlic and onion. Add water to the slow cooker, leaving some pork uncovered. Slow cook on low for approximately 5 hours, or until it is tender enough to be shredded easily with a fork. Remove the pork shoulder, remove the skin, shred the meat into pieces. Toss through the Chipotle BBQ sauce. Pulled pork is amazing. The sauce is a combination of sweet and smoky and works perfectly with the pork. I look forward to finding new ways of cooking with pulled pork in the future. How do you serve your pulled pork?